Belfast is a city where you will find a lot of cars. Most people use cars to get from A to B, but as a tourist you will probably come with plane to George Best Airport or Belfast Airport, and in that case you need more information about public transportation and the usage of taxis in Belfast. Most buses are operated by Translink, and they call these buses Translink Metro. Do not be confused, no metro can be found in Belfast, only buses, often named metro. Another company serving smaller areas around Belfast is Ulsterbus, but in general the Translink services are what you will use as a tourist. If you want to travel from Belfast to Dublin Airport and Dublin, you should consider using AirCoach. If you want to buy a day ticket for the metro services in Belfast, the price is £3.50. If you buy an off-peak (from after 9.30am) ticket the price is £3. 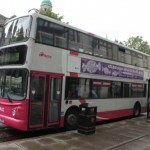 The railway system in Belfast and Ireland is operated by Translink. The main station in Belfast is named Belfast Central, and this is only 5-10 minutes on foot from the city centre and Victoria Square. From Belfast Central you can for example travel to Dublin in 2 hours. In Belfast it has become quite normal to rent private drivers beforehand. It can not be seen on these cars that they are taxis, but they are so called private mini-cabs. The normal taxis in the centre have black colour.